The only regularly operating ferry on the Potomac River is the General Jubal Early, owned and operated by Edwin Brown and Malcolm Brown of Dickerson. The General Early has been in operation nearly 30 years, providing reliable service except during severe ice or flood conditions on the river. 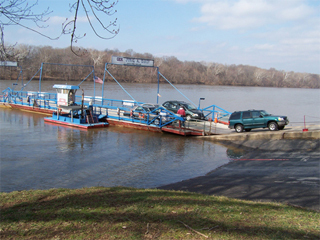 The White's Ferry crossing is the closest river crossing above the Capital Beltway in metropolitan Washington; when the Beltway is jammed, some motorists opt to take the historic ferry to cross the river. It is also the only river crossing between the Beltway and the U.S. Route 15 bridge at Point of Rocks, 10 miles upriver in Frederick County. White's Ferry is a popular location for fishing, especially for smallmouth bass. The store has rowboats and canoes for rent as well as groceries and bait. Picnic tables are also available. The Maryland Department of Natural Resources classifies the area from Seneca to the Mouth of the Monocacy River as "catch-and-release" for bass.